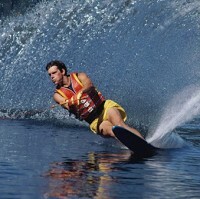 The water ski season is set to kick off this weekend with the Beaver Lake Challenge Water Ski Tournament in Arkansas. The event, which is free to go and watch on Saturday and Sunday, will act as a precursor to the North Carolina State Championships that are also being staged at Beaver Lake on 13-15 July. It is thought that around 50 people will take part in the slalom, trick and jump disciplines and the president of Beaver Lake Ski Club, Jeff Mitchell, thinks the attendance will be good because of the upcoming championships in July. "We expect a good turnout for this event because people that will be returning for the state championships in July will want an opportunity to ski on the lake before competing for state," he said. "The Beaver Lake Challenge is kind of a continuation of what we started back in Camden with the River City Challenge for all those years." The lake is located two miles north of the Chowan River Bridge between Suffolk and Ahoskie and one of the highlights of the July tournament will be a night jump competition, making use of the new lights, so anyone travelling to compete will need to ensure they are covered by sports travel insurance.